You may remember my somewhat recent watercoloring on glossy paper posting using this adorable Greeting Card Kids stamp set. Well, I’m back at it again, this time with a Valentime’s Day theme. I just loved this cute little girl and thought she needed to be colored up for the holiday. It was the same idea, heat emboss the stamped image – this time in black – and grab my neglected aqua brush and get to work coloring and blending on glossy paper. I tried my hand at shading with mixed results. But then I preceeded to distract from… ahem, I mean highlight, the coloring with some brightly colored accents on the card. From the Real Red polka dot dsp from the Polka Dot Parade pack, to the wrapped Cherry Cobbler bakers twine… and just a touch of bling in the corner. All adds up (I think) to a sweet little card that needs no sentiment at all. And if you know me and how hard of a time I have leaving a card front sentiment-free, you know this is a big deal for me! ha ha! So, grab your aqua pen and give it a whirl. I promise it’s fun! Need a Spring Catalog or Sale-a-Bration brochure? Its been such a whirlwind month around here with 2 birthdays down and Christmas behind us – only one more birthday in our family to go! But I was fortunate enough to receive a few Christmas cards from my friends and I loved them so much that I just had to share! First up, I love this vintage feel that Tanya created by her color choices of Very Vanilla naturals paper, Chocolate Chip, and Old Olive. 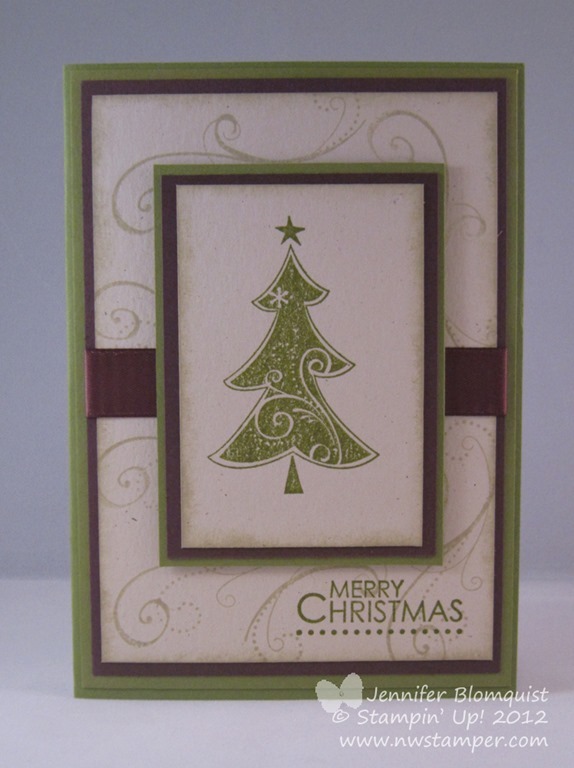 Plus the sponging around the edges to create a cool Christmas card. I also received this cool Christmas card from Liz. I loved the idea of using the Dazzling Details to make the glimmery dots around the Tulip Frame embossing folder. I know the picture is a little dark, but it is so sparkly in person. 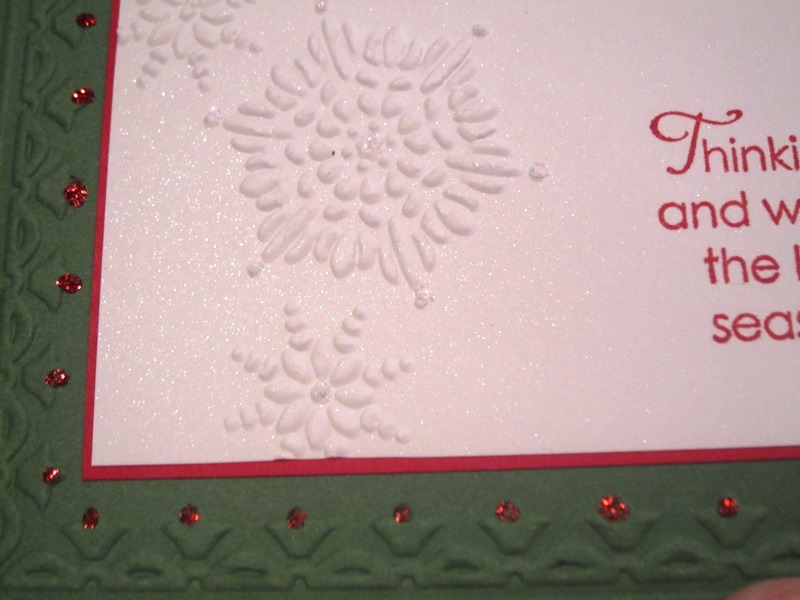 Plus she did her embossing on the Shimmer White paper. I tried to catch it in the light…. can you see the shimmer? Well, I guess that wraps up Christmas projects for the year! Now on to spring projects and new goodies from the Spring Catalog and Sale-a-Bration exclusive event! Do you need a Spring Catalog or Sale-a-Bration catalog? 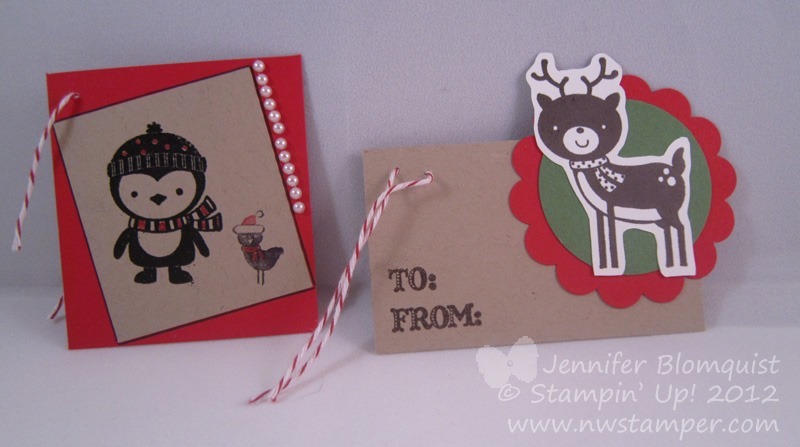 Just send me your name and mailing address to jennifer@nwstamper.com and I’ll get you all hooked up! Christmas Eve was the start of a wonderful few days with my family; and so I’ll be busy with family dinners, gift exchanges, and playing with the kids. But I wanted to make sure to stop by and wish you all a very merry Christmas! Whether you are with family or celebrating in your own special way, I hope you have a wonderful day and are able to take some time this holiday month to relax and enjoy all the good things in your life. And thank you too for being a part of my life and journey as well. I am blessed to have so many friends, fans, and readers to make this creative stamping adventure I’m on, be the most inspiring and amazing one for me. So, THANK YOU! I always do this… pick a card to send to someone (in this case Christmas cards), grab an A2 envelope (the type made to fit a 4-1/4” x 5 1/2” card), and then as I’m going to stuff the envelope realize that I’m mailing out 4×6 cards… which doesn’t fit in the envelope! 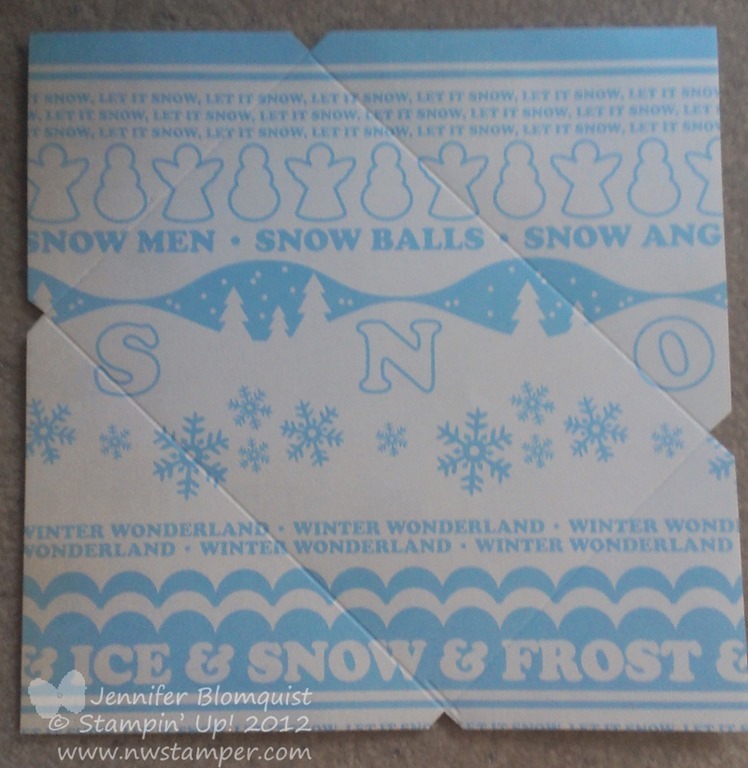 This year, however, I was motivated and determined and so I grabbed my Simply Scored and Diagonal Scoring Plate and decided I was going to figure out making my own envelopes this year. Plus it was a good way to use up some really old 12×12 scrapbooking paper that I bought when I first got started and didn’t realize the difference in quality between the different companies. Anyway, so I thought I would share with you some tips I learned while running this experiment! 1. 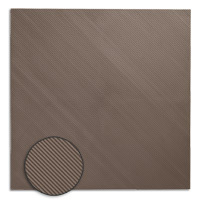 First, grab some of that cheap scrapbook paper that is printed on one side and white on the other (or if you want to match your project, grab some nice 12×12 designer paper and I recommend at least one side be pale or very small patterned so you can have that as your outside to write your address on. 2. Next, cut your paper to size. I found a great measurement list from Jackie Topa that I used to determine that I needed an 8” x 8” square. I scored at 3-1/8”, rotated and scored at 4-1/2”, rotate and score at 3-1/8”, and then finally rotate and score at 4-1/2”. She lists another measurement but I didn’t understand what it was for so I skipped that one! Tip: When you are using the lightweight or “cheap” paper, I recommend using the fatter tip of your stylus for scoring. I found that the skinnier tip made me nervous about tearing the paper since it had so much pressure in a tiny spot. 3. Your score lines will cross each other near the edges of your paper. Trim out the triangles where they cross each other. Now, as you look at the picture above, you may notice something funny going on. That is right! I was trying to use paper that had text on it and cut my 8×8” piece for the envelope, only to discover that once I scored the paper that the text was now going to be going at an angle! So if you care about orientation of the pattern on your envelope, take into consideration your preferred final layout before scoring. In fact, if you can cut your paper down so that the words/pattern is going at an angle on your 8”x8” square, than you will be in great shape when you start scoring. 4. Fold over the flaps and glue one big flap to two of the little-side flaps. Once you stuff your envelope, you can adhere the last side. 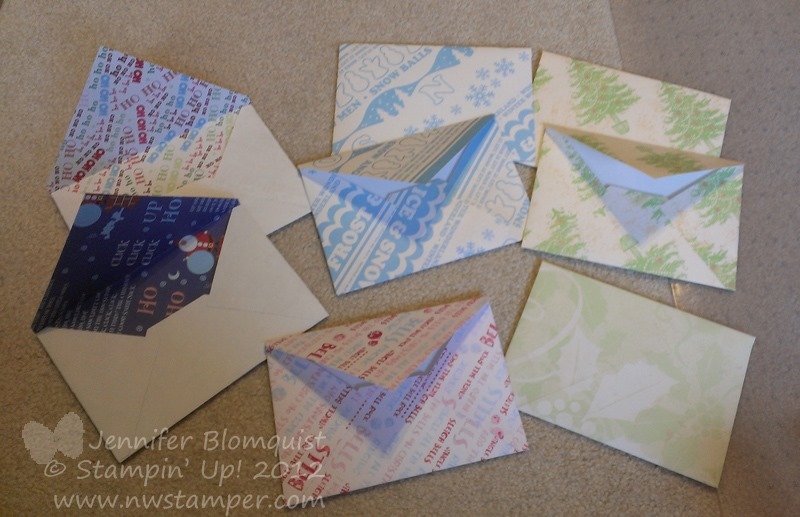 Tip: If you want to make your envelopes in advance and be all ready to go. Put some sticky strip on the last flaps of your envelopes. 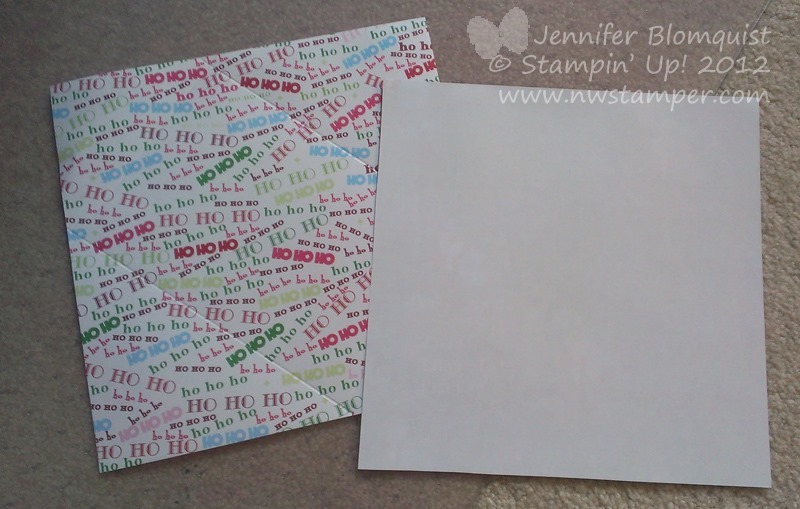 You can leave the tape covering on the exposed side so that it will be adhered to you envelope but doesn’t stick to anything else until you are ready to mail the envelope and you peel off that red backing! 5. Stuff your envelopes and you are ready to go! I just thought I would show you what I ended up with for now. The dark and busy patterns I used as insides for my envelopes while the paler and more solid patterns I used for the outside of my envelopes. So I hope that was helpful to you and that you will have lots of fun experimenting and creating your own custom envelopes! Ok, so Christmas is only 2 days away! Eep! Are you ready and have all your presents wrapped? I’ll admit, I have most of them wrapped but not all of them! It all started with me stamping a bunch of images on scrap paper and then picking up extra cardstock scraps from around my craft table and punching or cutting them into roughly tag shapes. 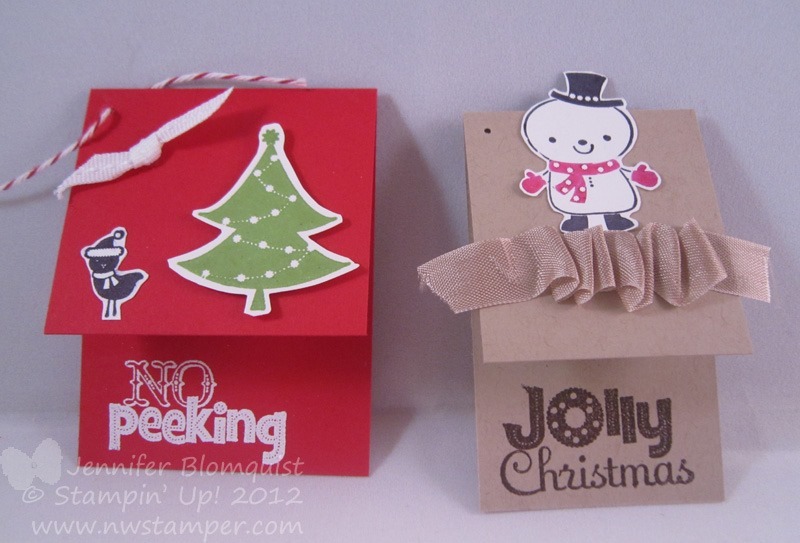 Next were some simple flap style tags. 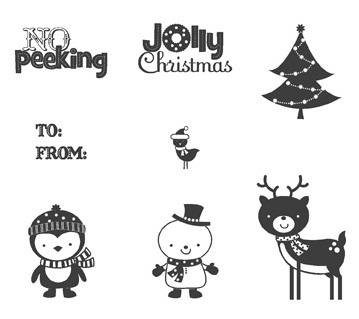 I scored them so that the heat embossed sentiment (white for the “no peeking” and Early Espresso for the “Jolly Christmas”) would show when it was closed. Then I decorated the flap with cut out stamped images and ribbon. Next I was on to some more simple tags. 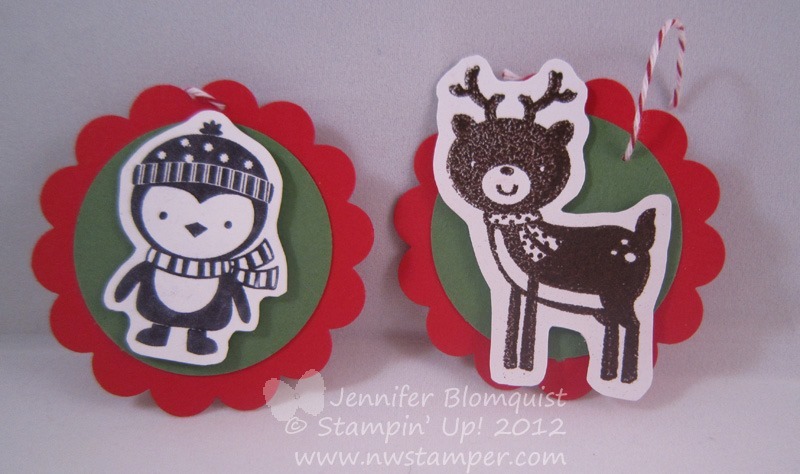 I just embossed or stamped the images of the penguin and reindeer and cut them out, then layered them onto the Real Red scallop and Gumball Green circle. Stamp the “To: From:” sentiment on the back and you are good to go! And finally, my ultimate in playing. 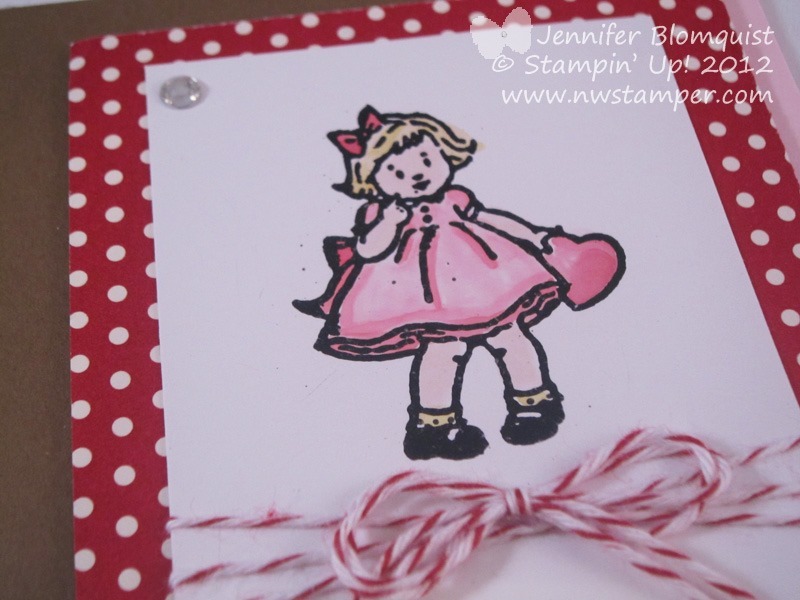 I had the scrap of Crumb Cake and Real Red and decided to do a twisted tag. I stamped and then heat embossed the penguin in Basic Black (it looks awesome heat embossed by the way) and then colored in some of the spaces with my Real Red marker. Then I stamped a little bird next to him also in Basic Black (you can see how much nicer it looks embossed this way). Then I added some “snowballs” aka pearls along the side. So there you have it! 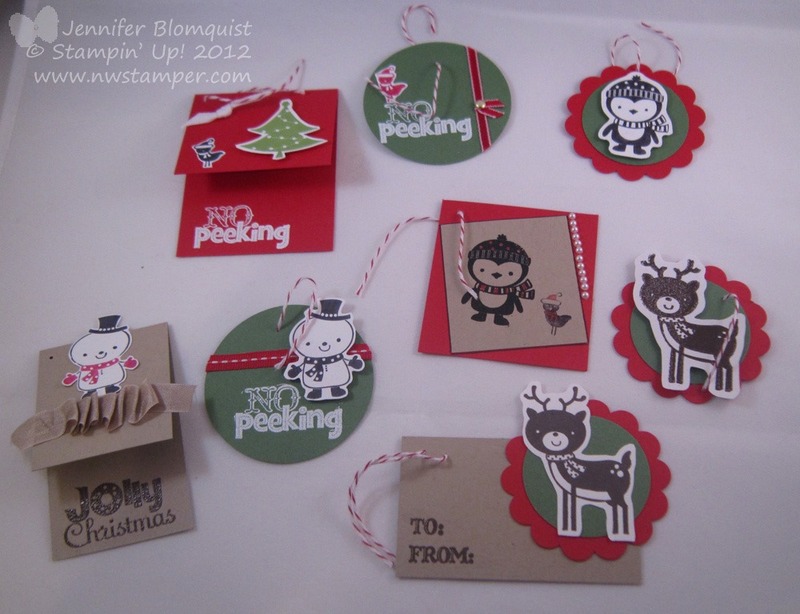 Some quick last minute gift tags to add a touch of handmade to your projects. Gift Certificate Bonus Bucks for You! Can you believe there is less than a week until Christmas?? I guess I better get on this whole mailing packages (and my Christmas cards…) thing. Well, if you are like me and still trying to find a few last minute gifts, then have I got a cool deal for you! Receive an extra $5 FREE for every $25 in gift certificates you purchase from me. Yep, that is right… give a bigger gift or give yourself a treat while buying those last minute gifts for others. Plus with the Spring Catalog and Sale-a-Bration around the corner, why not treat yourself and stack free bonus bucks with your free Sale-a-Bration items too! Email me at jennifer@nwstamper.com to pick your certificate. I can email you a digital copy within 24 hrs or will print and mail a physical gift certificate in a cute card if you have a little more time. Thanks for the Cute Birthday Wishes! It is days like my birthday that I’m reminded of how much a homemade card really means. This year, I felt really special to receive some unexpected cards in the mail (and in person) and they were cute cards too! So cute in fact that I just had to share them with you all! Way to make a girl feel special, Pam! 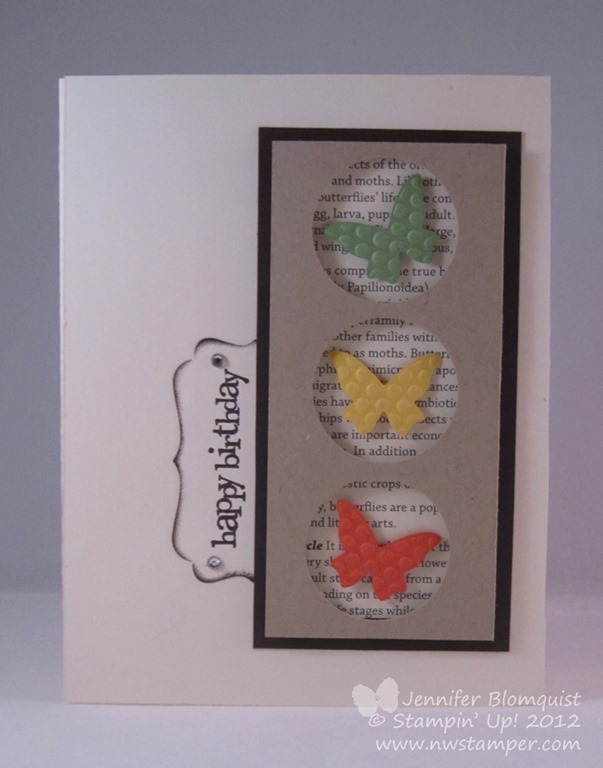 I love this card too because it is totally something I would never have come up with either. I love this dsp but never knew quite how to use it but I like how she used it here. Tanya is a queen of clean and simple (and stunning) cards! I love her colors and the simple design that totally pops. Again, I just felt special that she made such a cool card for little ol’ me. So, thanks ladies! You really put a smile on my face for my birthday this year and I really appreciate it! I honestly just feel lucky to have met and become friends with such amazing and talented people!